Rosie’s is one of the older venue’s in Market Row. It is a very small cafe during the day and will do dinner in the evening in the latter part of the week but only if you book. During the day Rosie’s offer’s sandwiches, wraps and limited hot food. The excellent sandwiches are not cheap but worth it. The addition of a small amount of salad though doesn’t justify the hike in cost particularly when the salad promised so much but in the end they had run out of stuff. This is a small perfectly formed cafe/deli – about eight tables closely packed with a mixture of old school tables and chairs. You insert yourself into a space and almost everyone needs to move when you need to get out again. It is styled in the 50s with things you might want to buy but unless you have been sitting there for a while you don’t notice they have them as its part of the background. 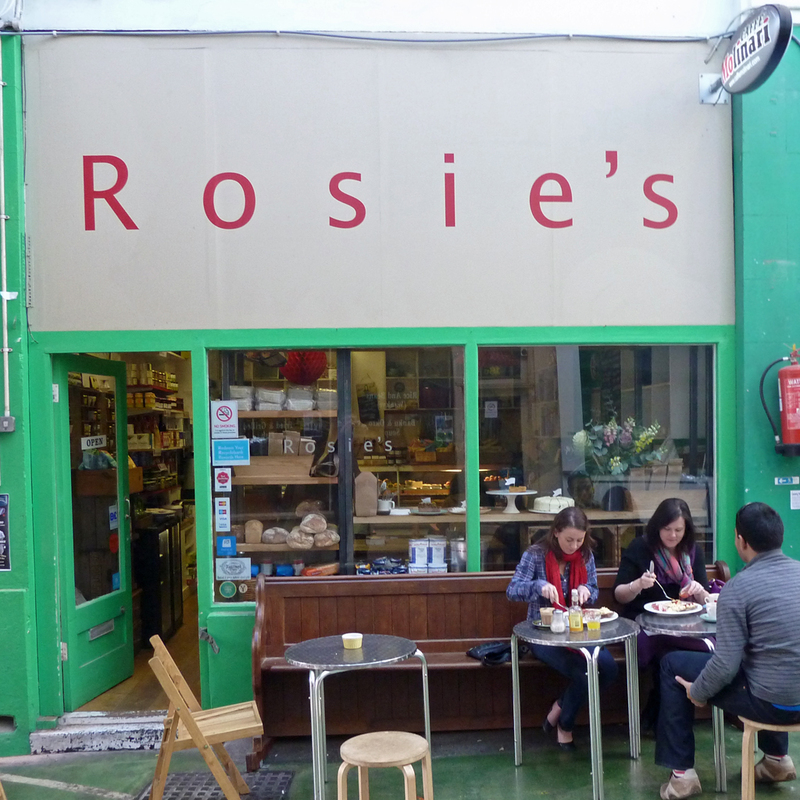 So you go to Rosie’s for some good food (probably organic) or more likely to hang out with a coffee and a cake. The menu changes regularly and the website hadn’t been updated for many months but based on my last visit I recommend their hot salt beef sandwiches mainly because it is difficult nowadays to get one so cheap yet so tasty! You can go to the “supper club” starting at 7.00pm on Thursday and costing £30 per head. AN UPDATE – Rosie’s is now opening late on Thursday and Friday and you don’t need to book although it is advisable. This is BYO so make sure that you bring some along as there isn’t much wine nearby on Coldharbour Lane but plenty of beer. On our night it was lamb ragou and couscous with pickled lemon followed by earl grey rice pudding -both delicious. We also had scented chocolate truffles that came with tea (our choice instead of masala coffee) at the end of the meal. The tea (and the rice pudding) was served in lovely delicate cups. Of the truffles there were some that were very, very good and some were more of an experiment you might not repeat. Rosie has already produced one cookery book and she is now writing her second.